(Ma'yan: The Jewish Women's Project) The newest edition of The Journey Continues has a new format and full color illustrations. With its emphasis on the role of women in the Exodus story, The Journey Continues weaves together songs, poetry and readings that are both traditional and new. It includes gender inclusive English blessings and transliterated Hebrew as well as both traditional and feminine Hebrew blessing. This new edition contains explicit directions and suggestions for activism. Words of songs written specifically for The Journey Continues by acclaimed composer and singer Debbie Friedamn are included in the Haggadah. Section on Miriam's cup, Elijah's cup and an explanation of the orange on the Seder plate. By Sue Levi Elwell The Open Door includes traditional and innovative blessings, extensive commentaries and supplemental readings, Miriam's Cup and women's voices, gender inclusive language, more than 40 pages of traditional and newly commissioned music and magnificent full color art. This Haggadah fulfills its own stated goal of being "the essential Jewish travel guide," using the seder to transport readers from the past through the present to the future. A product of Reform Judaism, the book seeks to embrace and celebrate the "expanded" Jewish community, drawing upon the writings of female rabbis and relating Passover customs from all over the world. The book is gracefully illustrated with full-color drawings by Ruth Weisberg, and is complemented by more than 50 pages of traditional and new music. Jews who are seeking a diversity of voices and experiences at their seder will cheer the arrival of this Haggadah, which reflects a fresh perspective on emancipation. By Rabbi Sharon Cohen Anisfeld, Tara Mohr, and Catherine Spector The complete sourcebook for creating your own women's seder. This practical guide also includes discussion questions, texts, and exercises for further study, to help you transform the planning process for your women's or family seder into a Jewish learning experience. In 1993, a group of Yale students gathered for an unprecedented event at the university: a women's Passover seder. In the decade since, students have revised and perfected the "Yale Women's Haggadah," a special liturgy for the women's seder. Rather than simply publishing this Haggadah of commentaries and alternative texts, the group (now stretching far beyond the bounds of New Haven) decided to write this sourcebook for planning women's seders. Some of the selections come from unpublished liturgies from campus Hillel groups, individual congregations and Jewish women's organizations, but most were solicited from female rabbis, scholars and other notables such as Ruth Bader Ginsburg, Anne Roiphe, Lynn Gottlieb and Judith Plaskow. The manual closes with a practical appendix on how to plan a women's seder. By Rabbi Sharon Cohen Anisfeld, Tara Mohr, and Catherine Spector A powerful--and empowering--gathering of women's voices transmitting Judaism's Passover legacy to the next generation. The Women's Passover Companion offers an in-depth examination of women's relationships to Passover as well as the roots and meanings of women's seders. This groundbreaking collection captures the voices of Jewish women--rabbis, scholars, activists, political leaders, and artists--who engage in a provocative conversation about the themes of the Exodus and exile, oppression and liberation, history and memory, as they relate to contemporary women's lives. Whether seeking new insights into the text and tradtions of Passover or learning about women's seders for the first time, both women and men will find this collection an inspiring introduction to the Passover season and an eye-opening exploration of questions central to Jewish women, to Passover, and to Judaism itself. This Passover "companion" for women will be useful to those who desire a new women's Haggadah and ritual or those who simply seek to better understand the feminist themes of the traditional liturgy. The essays address three key subjects: the Passover holiday, the biblical book of Exodus and the new tradition of women's seders. Vanessa Ochs contributes an essay on "setting a cup for Miriam," tracing the evolution of Miriam's cups at contemporary seders and discussing the importance of having a new ritual object for women. Like many of the other essays, Ochs's is enriched by her personal experiences of inaugurating new traditions for Passover; the book's best section, in fact, is one called "Telling Our Stories." By Mordecai Menahem Kaplan Whether at a model seder, a community seder, or a family seder, The New American Haggadah will inspire and delight participants of all ages. First developed as The New Haggadah, this Passover classic has been revised to reflect the experiences of our generation and the contributions it has made to the holiday's message of universal freedom. Gender-sensitive language with elegant translation, transliteration of the original Hebrew text, music, and instructions for the leader combine to offer an accessible--and uniquely American--Passover seder. Russian Translation Also Available This revolutionary Haggadah is written in gender-inclusive contemporary language and has sold over 1 million copies since its introduction. Illustrated with twenty-three original full-color watercolors by Leonard Baskin, it contains a complete Passover home service, an extensive song section, and supplemental readings and meditations from which the participants can choose during the course of the Seder. All optional selections are printed in color. By Martha Shelley Haggadah means "the telling." The escape from Egypt is the defining legend, the central drama of the Jews. Every nation coalesces around such an epic; its people project themselves into the story, aspire to the virtues of its heroes, and through periodic retelling or dramatization, transmit their values to the next generation. The traditional Haggadah offers a set of instructions for conducting the Passover service, interspersed with readings from the Bible, rabbinical commentaries, legends, prayers, hymns and children's songs. Written by men and addressing men, though, the traditional text has not historically offered much space for women to see themselves as fully involved in or spoken to by the powerful drama of human freedom articulated by the Haggadah. For Martha Shelley, creating this re-visionary version of the Haggadah meant opening up that much-needed space for herself and other women within this tradition: "I wanted to write a Haggadah that addresses women, and not only Jewish women; one that speaks of our oppression and victories--and also of the darkness in our souls incorporating into a n that collaborates with Pharaoh. A Haggadah with a Gaian sense of the divine. And a Haggadah that sings. By E. M. Broner An underground classic, finally available in its own volume--a revised edition of the visionary Haggadah that has inspired top feminists and women everywhere for nearly two decades. Since its appearance in Ms. magazine in 1977, The Women's Haggadah has been photocopied and shared by thousands of women. This original, scholarly, and poetic work - a woman's telling of the Passover story - is the heart of the Seder in E. M. Broner's acclaimed book The Telling. Now, The Women's Haggadah is available in its own volume for the first time. Newly revised with Hebrew translation and transliteration, The Women's Haggadah is a celebration of women's history - a book to give and treasure for generations. By Elaine Moise & Rebecca Schwartz The Dancing with Miriam Haggadah is a groundbreaking work of creativity and spirituality, yet strongly connected to the tradition. The Dancing with Miriam Haggadah contains original prayers, commentary, poetry, music and art. The traditional Passover symbols appear, but they are experienced and interpreted with a feminist understanding of life, history and the earth. By Ruth Simkin Not so very long ago, a woman wanted to know why women can't be up on the bimah (altar) holding the torah. She asked the rabbi why this was so. The "learned rabbi" responded, stroking his beard: "A woman should be on a bimah like an orange should be on the Seder plate!" Now, each year at Passover, we give to an orange the place of honor on our Seder plate. 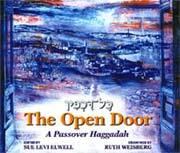 This Haggadah is a script for sharing the Passover Seder together in a contemporary manner. All the rituals and symbols of Passover are explained in a way that brings the past into the present in a manner which is enjoyable, meaningful and informative. This unique Haggadah is lesbian centered and woman affirming. It is truly a celebration for all.